WASHINGTON —Rep. 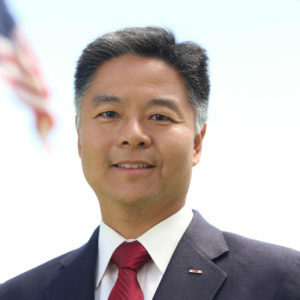 Ted Lieu (D-Manhattan Beach) was elected by his Democratic colleagues on Nov. 29 to House leadership as a Democratic Policy and Communications Committee co-chair. As DPCC co-chair, Lieu will help guide messaging strategy for the House Democratic Caucus. He received the highest number of votes for the position and is the only Asian American member and only veteran in House Democratic leadership. “Thank you to my colleagues for electing me to House Democratic leadership as a DPCC co-chair,” Lieu said. “I am honored to join David Cicilline (Rhode Island), Debbie Dingell (Michigan) and Matt Cartwright (Pennsylvania) in shaping Democrats’ bold and inclusive messaging to move America forward. “Democrats made history in 2018 by winning the largest popular vote margin in a midterm in U.S. history. We’re ushering in the most diverse, dynamic and enthusiastic caucus we’ve ever had. It’s an exhilarating time to be in the House and I’m honored to have a leadership role.